What does winter mean for your food supplies? You won’t see much locally-sourced fresh produce, but modern global supply networks can cope with that. If it’s too cold to grow fruit and vegetables locally they can simply be imported from warmer climates – that’s why you can buy oranges all year round. For the pioneers, facing harsh winters on the frontiers of the American West, things were very different. Primitive transport systems built on horse-drawn wagons limited the movement of food – even when the railways came along, without refrigeration there were still serious limits on what could be transported. Town stores sold a few staples, like flour, salt, sugar and rice, but people mostly lived on what they and their neighbors produced themselves. In winter the options closed right down, because for months nothing could be grown. 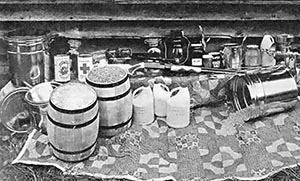 To survive until they could start planting again in spring, the pioneers had to spend much of summer and fall building up food supplies for the approaching cold months. Most food won’t keep for months without being preserved somehow. There are exceptions – if you keep them protected from damp and vermin, dry goods will last a long time. Almost everything else needed preservation, though. The pioneers used various methods for this, and were able to store quite a wide variety of foods for long periods. The bulk of a winter food stockpile was usually carbohydrates, especially flour. Vegetables and fruit were also a major part of it. Meat usually had a lower priority, because game could still be hunted in winter, but as much as possible would be preserved anyway; hunting isn’t always reliable, and can be risky in extreme weather. Let’s look in more detail at exactly what the pioneers stored, and how they did it. Flour was usually bought or bartered from the nearest trading post, and it was stored in large quantities – families would aim to go into winter with at least 100 pounds of flour for each adult, and an appropriately reduced amount for each child. Flour was usually delivered in sacks, so it needed to be protected from dampness and pests. Sacks would be stacked on a low platform raised off the floor; the storeroom would be checked regularly for mouse holes or signs of any infestations, and usually generously sprinkled with traps. Sometimes flour would be kept in barrels. These were also stored off the floor, but they gave much better protection against vermin than a sack. Dried beans were another staple. They’re a good source of protein, last for years if properly stored, and are quite resistant to pests. A few pounds of beans per person were a common part of winter stockpiles. Like flour, they were usually kept in sacks and raised off the floor. 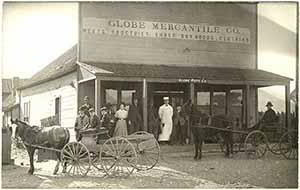 The same goes for rice; it wasn’t as common as beans, but many pioneers would add a few sacks to their dry goods store. A small sack of salt was essential. As well as being the basic seasoning it’s also useful for preserving more perishable foods. Finally, sugar. In the 19th century this came as a solid sugarloaf, usually shaped like a cone with a rounded end. Sugar nips, pincers with heavy sharp blades, were used to cut off pieces as needed. Sugar was an expensive luxury, and used sparingly. 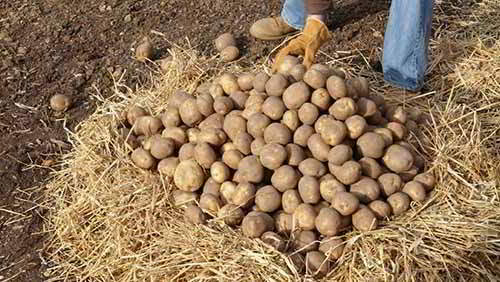 Potatoes, beets, carrots, turnips and most other root vegetables will last a long time if kept cool. The most common household way of storing them was in a root cellar. These could be fully underground, either under the house or dug into a nearby hillside. Alternatively they could be partly underground and with the roof and walls covered with a thick layer of earth. Some were even completely above ground, usually where the ground was too rocky or wet for easy digging. 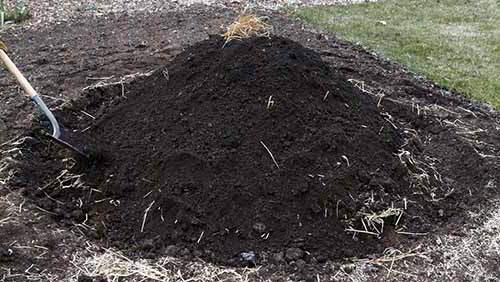 Its thick earth insulation keeps a root cellar at a fairly constant cool temperature. It protects food from both freezing in winter and the heat in summer. Root vegetable crops would be stored in wooden bins or barrels, and would last for months. Shelves in the cellar could also be used to store canned goods and other supplies that did best in a cool, dark place. For large vegetable crops a clamp was another option. To make a clamp, dig a rectangular trench about a foot deep. 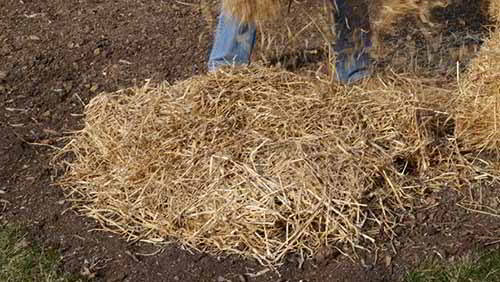 Line the bottom with a layer of brush and twigs, then a layer of straw. Stack the roots on the straw, forming them into a narrow pile up to about six feet high. 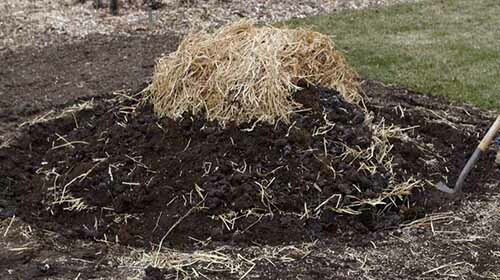 Then cover the pile with straw and cover it with the soil removed from the trench. Dig another small trench all round the clamp to help with drainage, and throw the soil from that on too. 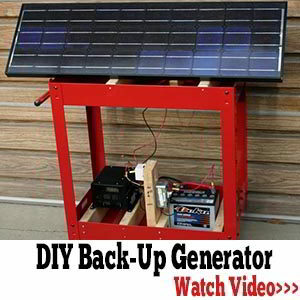 You should aim to have about a six-inch layer of soil completely covering the clamp. To remove vegetables open one end of the clamp and take out enough to replenish your root cellar, then reseal with straw and earth. Clamps work best in very cold weather, when the temperature stays below freezing for long periods. In wet winter conditions it’s best to skip the initial trench and build the clamp directly on the ground. 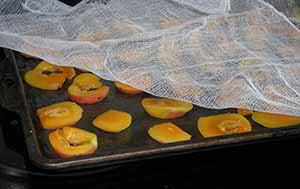 Some vegetables and fruits would be air-dried by slicing them thinly, laying them on a rack then leaving them for several days to dry. Racks would be covered in cheesecloth to keep bugs and birds away from their contents, and the slices would be turned occasionally to make sure they dried evenly. Once almost all the moisture had evaporated the slices would be stored in jars and kept in the pantry or root cellar. Canning was a major activity every fall. As fruit, corn and green vegetables were harvested, pioneer kitchens filled with jars and steam. Canners didn’t exist, so jars would be heated in a large pot on the stove or fireplace. When winter arrived pantries would contain scores, perhaps hundreds of jars of preserved food. Whenever possible pioneers would hunt or fish in winter, but sometimes they came back empty-handed. If a blizzard was blowing they couldn’t go out at all. To make sure they always had meat available, as much as possible would be preserved. In fall, surplus livestock would be slaughtered. Older animals, most pigs, surplus bulls – anything that wasn’t worth the fodder and effort of keeping it alive through the winter. Offal, which is hard to preserve, would be eaten immediately; most of the meat was processed and added to the winter stores. Thin-sliced beef would be air dried and turned into jerky, which could be eaten as a rugged, portable trail food or soaked to soften it for cooking. Beef and pork could also be salted. The best way to do this was to rub the meat with warm salt then pack it in barrels, adding more salt to fill the gaps as layers of meat were added. Alternatively, meat could be packed in the barrels then filled up with heavily salted brine. Properly salted meat would last for months, but it had to be soaked before cooking to wash away excess salt. For pork, smoking was a popular solution. Not everyone had a smokehouse, so they’d take their pork to someone who did, trading a share of the meat for use of the facility. Almost every family slaughtered at least one pig in fall, so carefully smoked hams and bacon were a common sight in frontier pantries. Even if the weather made hunting impossible there would be meat available to add taste and protein to the menu. Related:This Super Root Preserves Meat Indefinitely! Dairy products are highly perishable and difficult to store without refrigeration, but the pioneers managed to store some. Butter could be canned, but the easiest to stockpile is cheese. Almost any variety of hard cheese can be preserved with paraffin wax. The most common way was to melt the wax then brush the cheese with it. Two coats were applied to make sure there were no holes where air could get in. 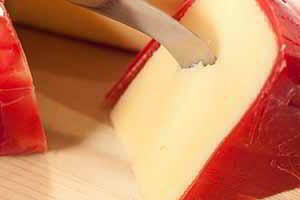 Once sealed in wax, the cheese could be stored for long periods in a cool place. Not only was it preserved, it would mature and improve its flavor. Hens lay more when they get more sunlight, so in winter eggs were few and far between. Paraffin wax came in useful here, too. Surplus late summer and fall eggs, collected as soon as they were laid, could be brushed or dipped with molten wax; like cheese, they got two coats. That gave them an airtight seal that stopped bacteria growing inside and spoiling them. A waxed egg would last in a cool place for six months, or perhaps even longer. Before using, the pioneers would strip the wax from the egg and put it in a bowl of cold water. If it sank to the bottom it was still good; if it floated it had spoiled. The more time between laying and waxing, the more likely the egg is to spoil. The pioneers didn’t have the benefit of modern supermarkets, but they were experts at preserving a wide variety of foods. A family on the frontier would have hundreds of pounds of food in store at the beginning of winter, and they used it carefully – waste was a serious matter. Nature took enough of a toll; ten percent or more could be lost to pests or spoilage. Households would preserve and store as much as they needed for the winter – then keep on canning smoking and salting, packing away everything they could. Any surplus was a safeguard against unexpected losses – animals breaking into a clamp, or a serious pest infestation in the root cellar. Families would also donate surplus to neighbors who’d lost their reserves – after all, next winter they could be the ones who needed the help. We’re spoiled by refrigeration and modern shopping, but if the SHTF all that will be gone in days. At that point, those who can fall back on the skills of our pioneer ancestors will be the ones who can watch the first snow fall and look forward to seeing spring. 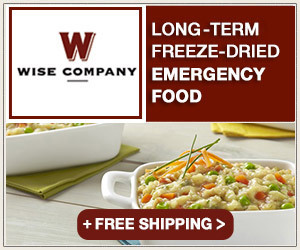 Because if you don’t know how to put up a few hundred pounds of preserved food it’s going to be a long, hard winter. Since paraffin was wasn’t discovered until 1830, a pioneer would be considered to be someone like my great grandfather who fought in the Mexican American War and homesteaded in Nebraska in a sod house, and not like my great-great grandfather who lived in colonial times. The latter probably had to use beeswax, tallow or candle berry to seal his cackle fruit. wondering how they canned corn and green vegs. with no pressure canners. were they just processed longer? anyone know? some of my old canning books actually have processing times for these vegetables, but it’s usually around 3 hours and very unreliable! Corn was often dried and ground for meal. Beans and other veggies are great pickled. I make an end of the garden pickle with all kinds of left over vegetables, like carrots, celery, regular pickles, peppers, onions and more. I just use my grandmothers favorite bread and butter pickles recipe. I’ve had these last over 10 years in the jar! Water bath. Up until last year we canned everything by the water bat method. My wife is afraid of pressure canners. We will have ben married 58 years on Oct 22, so we must have done it correctly. my mother never owned a pressure cooker. She would put her vegetables in a glass jars put them in a large pan and boil them until the water in the jar was near boiling the allow them to cool the jars would seal themselves. Pickled in large crocks with salt. This would last all winter. 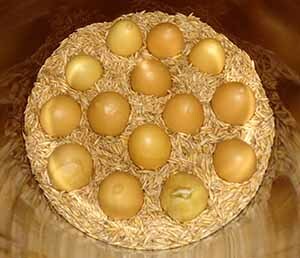 Just a note that some of the waxed eggs in the oats picture are pointy end up. Because of the air sac at the bigger end of the egg, if stored pointy end up, the air sac will separate by gravity and move up to the pointy end, causing the egg to go bad much sooner. Experiment with a few eggs in the fridge, and notice how fresh the big end up eggs stay when you break them into a fry pan: nice and firm whites, they don’t break and run all over. The pointy end up eggs run all over and the yolks often break. I’ve read that green beans called Leather Britches were strung and hung in the attic to dry. I dehydrate green beans for casseroles, soups, and stews. They are okay, just don’t reconstitute back to as to the original. Hence, the “leather” part. Drying beans is easier than canning them. Less prep with the jars and water bath. My grandmother and mother used to dry green beans on strings hanging in an attic until dried. When cooking dried beans (called shuck beans) they would wash the beans and then cook with ham or some bacon for flavor. They would slow cook for hours until rehydrated and soft. Salt and pepper to taste. I remember that they were delicious. One of my grandmothers still cooked on a wood stove. The food always tasted better I thought!! I have dried beans like this and could never get them tender when cooking. Canning is best if you can do it ! My mother canned everything she wanted to can using a Water Bath Canner. She would first cook the vegetables in a big kettle or pan. Then she put them in clean jars, sealed the lids only finger-tight, then placed the jars in a Water Bath Canner for the final process. We had fresh canned vegetables all year long. Pioneers knew the signs of spoilage and checked the jars regularly plus they alwsys fully heated the canned foods after opening and before tasting to kill any bacterea. By storing canned foods in cool dark spots they had a much better chance for success.